We had an earthquake! An honest to goodness earthquake, right here in NY! By the time people read this blog entry, it'll be old news. I'm sitting on the couch, having a lovely lunch of pasta, baked ham, and cauliflower in a sour cream cheddar sauce. I stop moving, because I think I feel the couch moving. And then I ask Matt, "Has Monster (our cat) ever gotten stuck under the couch?!" Matt: "Huh?" And that's when I noticed it. My drink was moving on the table. It was rocking back and forth! Matt entered the room and I had the most peculiar look on my face (or so I'm told). Matt asked what happened, and I said, "I think we just had an earthquake." Me: "Yes, I think so! The couch was moving!" We both comment on how weird it is, Matt contemplates the house virtually imploding, and then we go about our day. And then I decide to check the news. In all seriousness, I hope all the people and animals near the epicenter are ok. From what I've heard, the earthquake was closer to the earth's surface, so that's why the quake was felt from so far away. As you can see, the horses were traumatized just minutes after the quake. I went out to check on them, and they didn't have a care in the world. Well, except where the best grass was. And I have to share my story. I was sitting at my computer trying to write, when it seemed like the floor was moving, and the place was shaking. I figured a ship had hit us, since we live on a pier in the harbor. Weird, I know. A picture tilted on the wall and there was some serious creaking and rattling going on in the kitchen. Very weird stuff. And for me, scary. I'm glad everyone seems to be OK, and the horses look like cool customers. Sue, glad all is ok up in your neck of the woods! A good reminder to have a disaster plan, especially with the hurricane possibly coming this weekend. What's next, locusts? 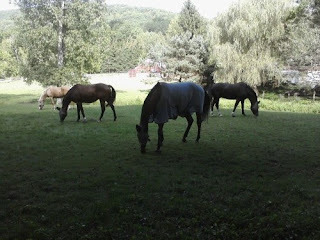 Hi KC, glad all is well and the horses are ok. I was driving home from westchester, my husband called "DID YOU FEEL THAT?" I did not. My parents live next door,came over hanging plants were swinging, cabinet contents shaking, but my husband and son felt nothing. They rolled their eyes thinking 'yeah ok' and chalked it up to a senior moment on dad's part. Then he put the news on. Sure enough.....I am so surprised our Clarisse (who is PETRIFIED of thunder and fireworks), had no reaction whatsoever. Honestly, I am bewildered by all this. I had no clue the hurricane was thinking of coming this way. I just hope it's kidding, and changes its mind. Let it find another party.